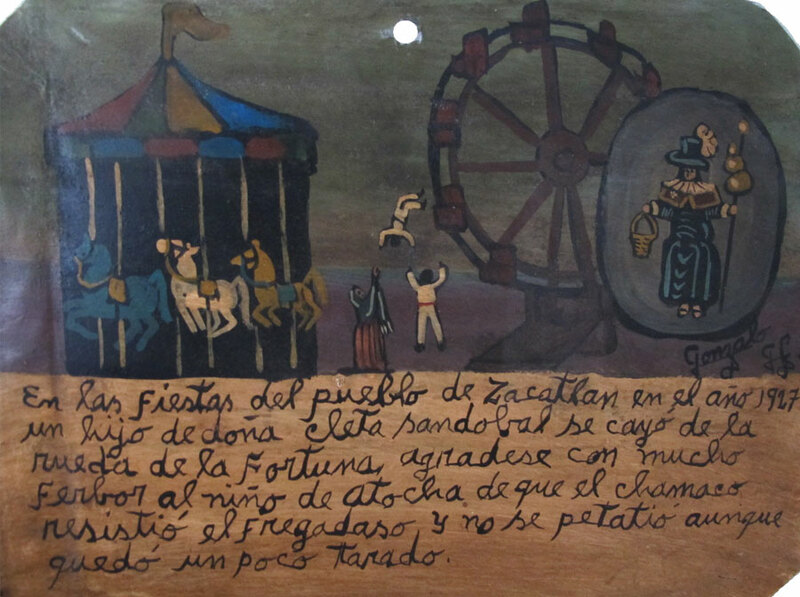 Panfila Rodriguez took too many rides at the carousel, she felt dizzy and nauseated. This feeling wasn’t passing so she prayed Saint James and felt relieved right that moment. 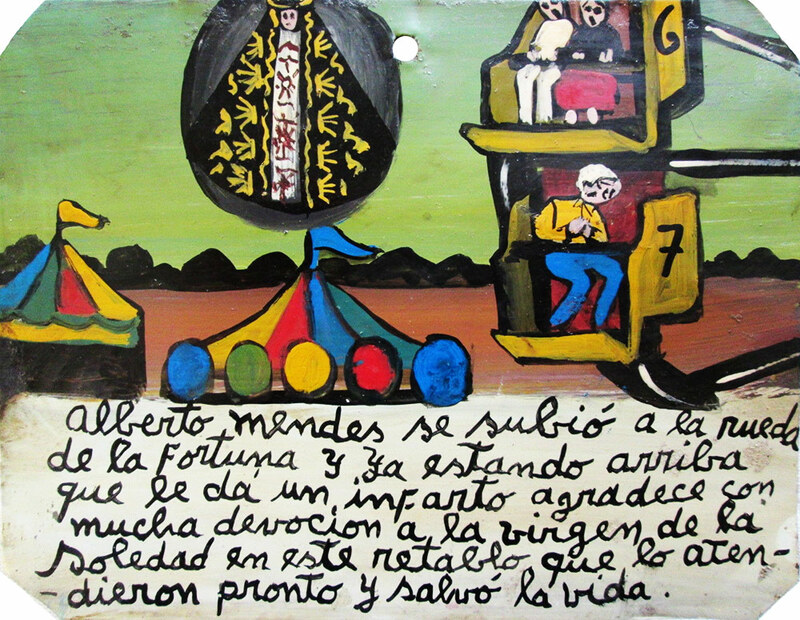 She thanks for that with this retablo. At the fair, Roberto Flores went to the hammer ride and had a heart attack. 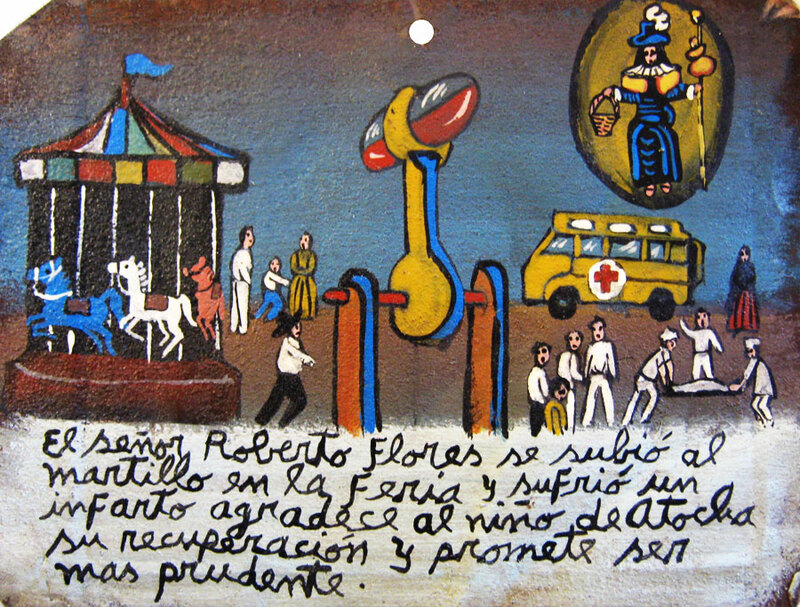 He thanks the Holy Child of Atocha for recovering and promises to be more cautious. 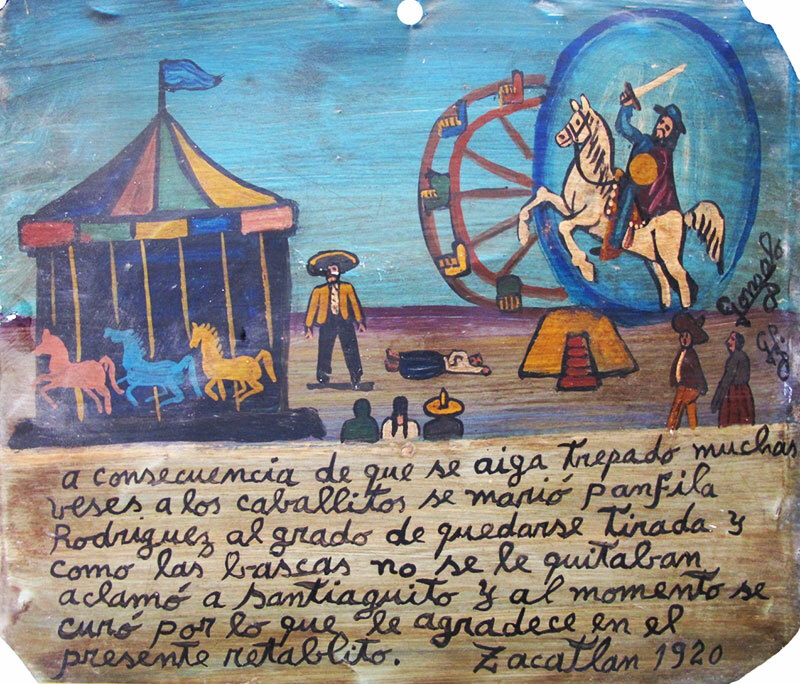 1927, during the celebration of the town day in Zacatlan, a son of doña Cleta Sandoval fell of the fortune wheel. She thanks the Holy Child of Atocha for the boy resist the hit and didn’t die, although he remained little bit dumb. 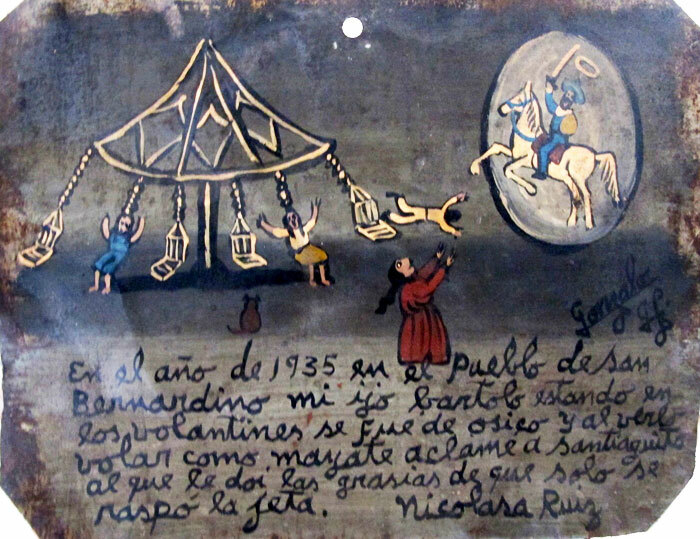 1935, in San Bernardino, my son Bartolo was riding on a carousel and flew off of his seat. When I saw him flying like a dung beetleI prayed to Saint James. Thanks to him my son only got his mug scratched. 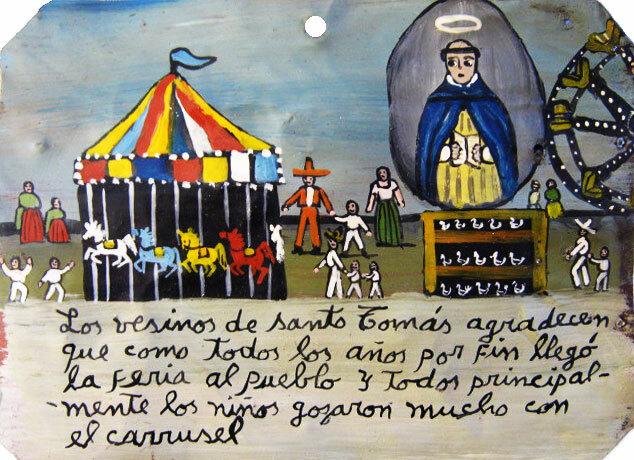 The Santo Tomas inhabitants thank because the fair finally came to their town, as all the years before. Everybody, and especially kids, enjoy very much the carousel. 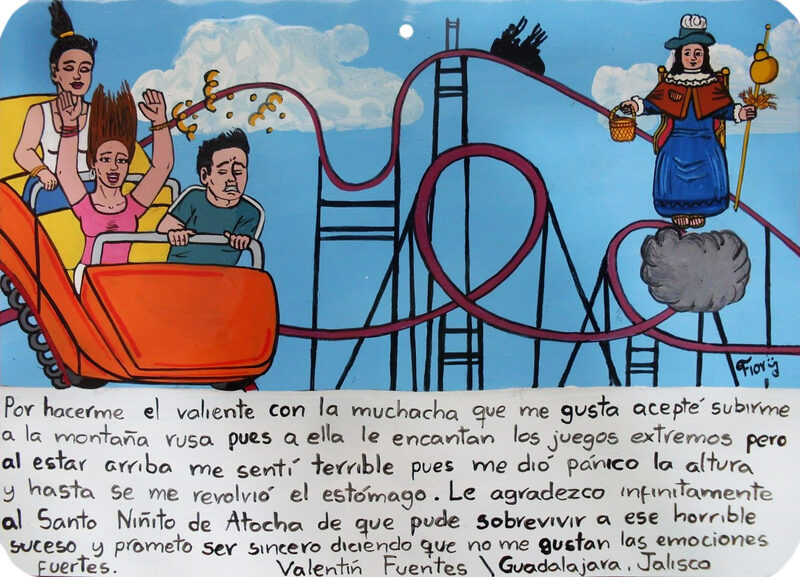 Cristina Gutierrez went to a roller coaster, but the cars got stuck. She thanks the Virgin of San Juan because she was saved, although she vomited herself. Alberto Mendez was on the ferris wheel and had a heart attack. 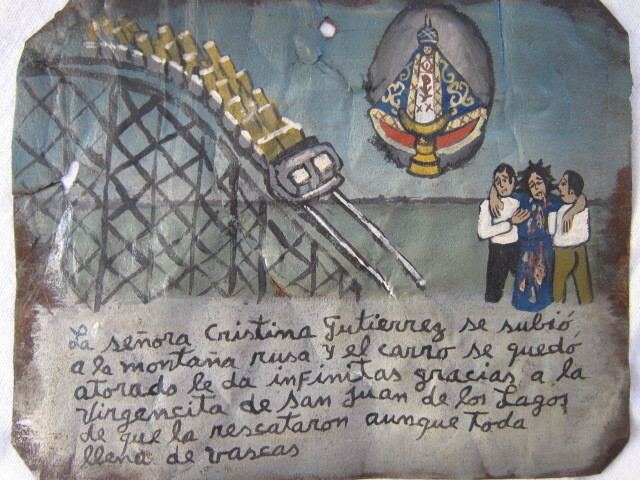 He thanks the Virgin of the Solitude with this retablo because he was helped promptly and his life was saved. I travel all over the country with my carousel. I come to most forgotten villages. 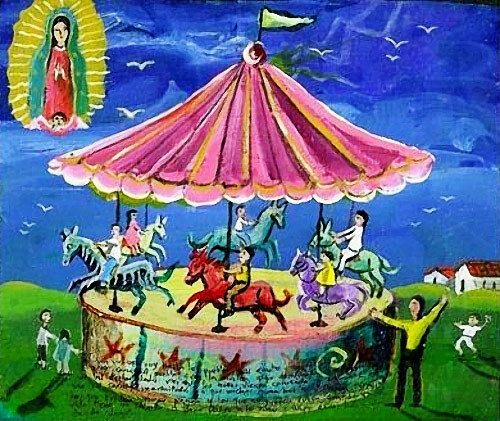 The children run to see the wonderful carousel, and I’m happy seeing their amazed faces, because usually they see something like this for the first time in their life. Who can, pays. Who has no money, also can ride a little bit. I thank the Virgin of Guadalupe for this job that allows me to travel and to bring happiness to the children.